Lego Avengers Assemble to the Helicarrier! The massive engineering-defying Helicarrier from the Avengers is a brilliant work of CGI. Too bad it’d never actually fly… Like… Never. Luckily, that didn’t stop our favorite RC hackers over at FliteTest from making a scale model of it — that actually works! If you’re not familiar, the Helicarrier is a fictional ship, the pride of S.H.I.E.L.D’s air force, or is it their navy. It’s a massive aircraft carrier with four huge repulsor engines built into it, borrowing tech from Stark Industries. The shear size of it is what makes it completely ridiculous, but at the same time, it’s also unbelievably awesome. Unfortunately, repulsor technology doesn’t seem to exist yet, so the FliteTest crew had to settle with a set of 8 brushless outrunner motors, with two per “engine”. The whole thing is almost 6′ long. [Dustin Evans] is a big fan of the recent Avengers movies — heck, we are too! So he decided to make this awesome Tesseract Case prop replica! Tesser-what? A tesseract, or cubic prism is a geometric shape that is technically a four-dimensional hypercube — in the Avenger’s movie, it is an incredibly powerful and unstable alien energy source. To make the replica, [Dustin] picked up a cheap aluminum tool case from the hardware store, took some measurements and began designing the inside of it using SketchUp. He’s crammed in an Arduino with a spectrum shield, a BlueSmirf Bluetooth modem, a Raspberry Pi, a 7″ LCD, speakers and an amp, a WiFi card for the Pi, and a few strips of Neopixels. It is running Raspbian with a stand-alone version of XBMC, which means using AllCast he can wirelessly control the box from a phone or tablet — now all he’s missing is a mini-generator that can put out a few million watts! This fantastic work by [Native18] shows a quad copter reproduction of the Heli carrier used by the Avengers. Following this thread (translated), you can follow along his thought process as well as his build process as he proceeds. 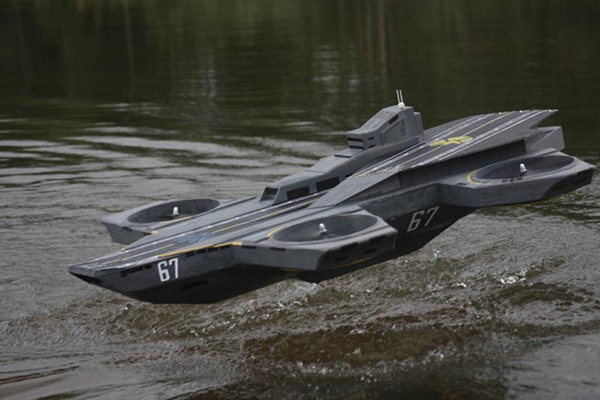 The construction is mainly paper and lightweight foam, but it still manages to float and even take off from the water. We’ve seen other aircraft carrier designs before, but not many this well polished, and none that took off from water.